The CN0170 is a two axis motion controller for step motor systems. It can operate as a computer peripheral or as a stand-alone unit. 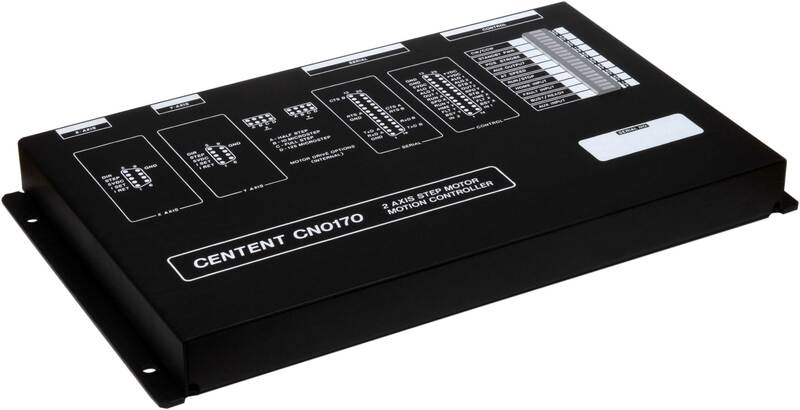 The CN0170 can store up to 3000 moves in non-volatile memory when operating as a stand-alone unit. A complete suite of motion control instructions are provided, from the simplest single axis move to full circular interpolation. 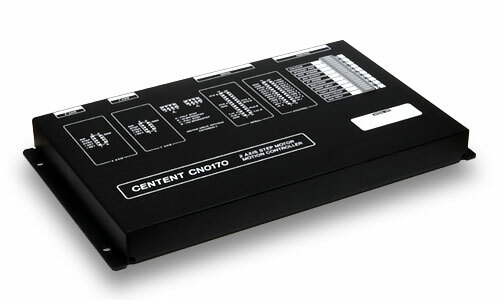 Also included are dedicated I/O for limit switch, home switch, and mechanism handshake, as well as general purpose I/O for easy hook-up in your application. 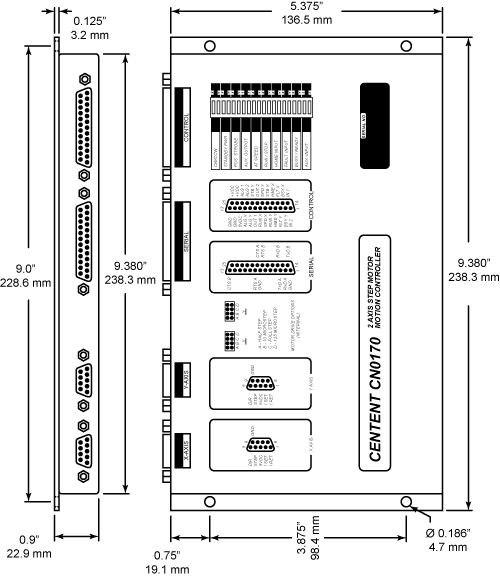 Most of these I/O lines have LED indicators for easy monitoring and diagnosis of the system. All commands and data consist of ASCII character strings utilizing simple mnemonics that can be written and maintained on a word processor. Communication with the CN0170 is over a serial port. 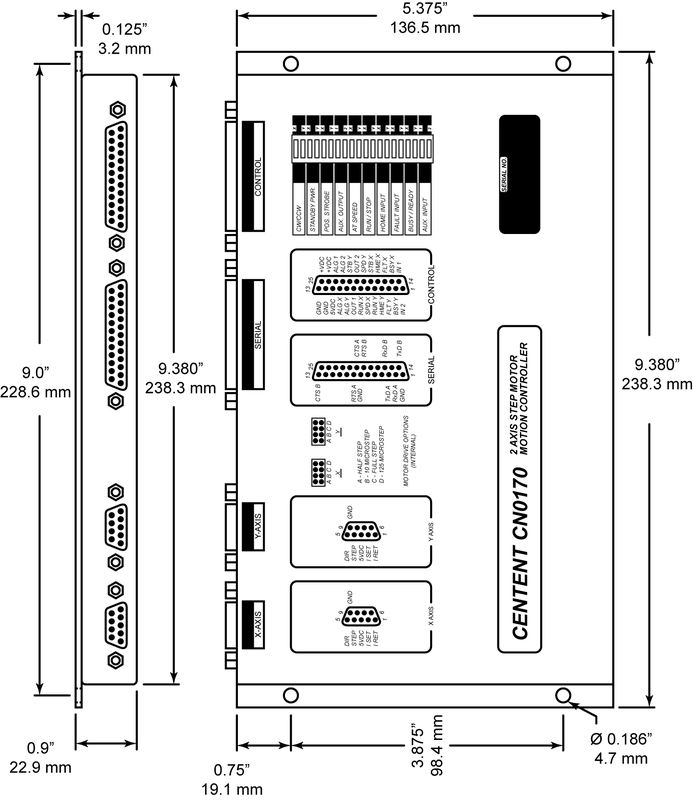 Multiple CN0170s may be daisy-chained together and programmed over a single serial port. Two 8 bit A/D inputs are available for joystick use or as general purpose analog inputs which can be read by the host computer. Size: .9" X 5.375" X 9.380"